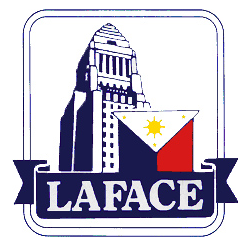 The Los Angeles Filipino Association of City Employees (LAFACE) is the only Filipino-American organization in existence in the City of Los Angeles. �It was formed in 1982 as an organization that empowers one of the largest racial group of employees in the City of Los Angeles. �The organization has gone through a lot of changes and is still changing and evolving. If you want to learn more about the association, LAFACE history will give you an insight on the struggle and dedication of the original founders to establish and unite the Filipinos in the City government . The outcome of this hard work resulted to the promulgation of its constitution and the approval of its registration of its Articles of Incorporation to the State of California. Section 1: The Association shall not be involved in partisan politics, locally or in the home Country. Section 2: The Association shall lead or extend assistance to any organization or movement intended to promote the economic, social, cultural, and educational advancement of Filipinos in the community. Section 3: The Association shall strive to foster the advancement of Filipinos and other minorities in City service and in other fields and shall cooperate with other minority groups towards achievement this end. Section 1: To assist Filipinos in seeking employment and promotion in City service. Section 2: To enhance the general advancement of Filipinos in City service. Section 3: To serve as advocate of Filipinos who may become victims of discrimination in City service. Section 4: To cooperate with other minority groups in promoting equal employment opportunities in the City. Section 5: To assist Filipino businesspersons and community organizations in acquiring contracts, funding, grants and other benefits from the City, except when a conflict of interest arises. Section 6: To disseminate to members and other interested parties news and information that are of interest and benefit to them.